With that in mind, it's probably an apposite time to do a Round-Up of some of the evidence out there on the benefits of physical activity, the problems associated with sedentary lifestyles, and the importance of building physical activity into everyday life, so that it doesn't become such a struggle for people to stay healthy. Instead of burdening people with the responsibility of making resolutions and struggling to stick to them, there is an easier way - allowing people to stay physically active without even realising it. 'Physical inactivity' is a term used to identify people who are not getting the recommended amounts of regular physical activity. According to the World Health Organisation, this 'recommended amount' is, on the face of it, not particularly onerous - at least 150 minutes of moderate aerobic activity a week, or 75 minutes of vigorous aerobic activity, for adults. This is the same advice given by the NHS in Britain. What is 'moderate aerobic activity'? It's an activity like brisk walking, or cycling, or pushing a lawnmower - enough to raise the heart rate, to make you warm, and slightly out of breath. By contrast, 'vigorous' aerobic activity is jogging, or running, or cycling with an equivalent amount of effort - an activity in which the heart rate is raised significantly. In other words, not only does cycling make it easy to gain those 150 weekly minutes of moderate physical activity - just cycling to and from work over a five-day week, for instance - it also makes it likely that we'll engage in some of that 'vigorous' aerobic activity, without even thinking about it. We should also mention 'sedentary lifestyles' - lifestyles with little or no physical activity whatsoever, and time spent sitting, or lying down. Physical activity can be presented technically in units, or METs (Metabolic Equivalents), where 1 MET is the amount expended by a body at a resting rate - for instance, just by sitting down. Moderate physical activity amounts to 3 or more METs, while vigorous physical activity is 6 or more METs. Even fairly relaxed cycling, at under 10 miles an hour, 'delivers' 3-6 METs. Why is physical inactivity a problem? Physical inactivity greatly increases our risk of developing diseases like diabetes, heart diseases, cancer, dementia, and depression. A recent systematic review with meta-analysis found that physical activity was associated with lower risks of adverse outcomes including all-cause mortality, cardiovascular disease, ischemic heart, disease, stroke, depression, dementia, type 2 diabetes, total cancer, colon cancer, breast cancer, and lung cancer (Golubic, 2014). Worldwide, the biggest killers are now diseases that are linked directly to human behaviour - almost three quarters of deaths are now from non-communicable diseases, with obesity and diet amongst the most significant contributors. Every year, around 3.2 million people on Earth die prematurely as a result of physical inactivity. When it comes to our country, physical inactivity contributes to around one in six premature deaths in Britain (from any cause), based on life expectancy estimates. And the figures are shocking when we examine the percentage of people who aren't getting the required amounts of physical activity. More than 40% of Londoners do not achieve the recommended 150 minutes of physical activity a week; the figure is even worse for Greater Manchester, where over 50% don't meet this figure, costing the NHS in the area over £500,000 every week. A 2015 study by the Centre for Economics and Business Research of the 'Inactivity Timebomb' across Europe estimated that physical inactivity costs the €14.2 billion every year, in the form direct healthcare costs, and indirect costs in the form of early mortality and the economic losses of unhealthy life. So... why is cycling (and walking) the answer? It's the fact it can be fitted into everyday life! Going to the gym, or making time for exercise, or physical activity, is hard. It's discretionary time, time that has to be set aside and reallocated from other tasks, jobs, and social activity. By contrast, cycling and walking can be built into everyday life, so that physical activity gains come without us even thinking about it. If it becomes a regular, ordinary part of day-to-day life, it ceases to be a chore or a task, and instead, something rather enjoyable. And as we all know, cycling is (usually) one of the quickest ways of making journeys in urban areas; we just need the infrastructure and environment in place to ensure that cycling is safe and attractive enough for everyone to be able to reap the physical activity (and time-saving) benefits. This is why an enormous amount of literature - and public policy - is increasingly focused on creating environments that enable active travel, as the best way to gain the benefits of improved public health. Whether it is Transport for London's Healthy Streets, Greater Manchester's more recent Made to Move strategy, Public Health England's Everybody active, every day: a framework to embed physical activity into daily life, or active travel strategies in Scotland and in Wales, active travel is increasingly embedded in transport policy, with good reason. In the Netherlands, a recent study found that the level of cycling in the country saves its economy $23 billion each year - the study suggested that the amount of cycling there also prevented 6,500 premature deaths each year. It's perhaps no surprise that the Netherlands has a far higher proportion of the population achieving the recommended amounts of physical activity than the UK. It's important to repeat in this context that what most Dutch people do on a daily basis is physical activity - in ordinary clothes, making day-to-day journeys by cycling, which is why so many people engage in it, without even thinking about it. The Dutch are not a nation of exercise fanatics; they just live in a country where active travel is easy. Cycling currently makes a much smaller contribution to population levels of PA [physical activity], but it does make a major contribution to the PA of those that use it. Although there is potential to increase both walking and cycling in the population, cycling has considerably greater higher because of the low base (in most places) and the greater distance which can be covered on a bike. The potential reach of e-bikes could be greater still. However it should be stressed that achieving Dutch levels of cycling in Britain would lead to less walking. One of the most recent studies has found that people who cycle to work have significantly lower risk of contracting heart disease and cancer, and a lower risk of all cause mortality, compared to people who commute in other ways. The findings were reported by the BBC. Research also suggests that people who are more physically active are less likely to die after operations, as well as recovering more quickly after them - deaths after surgery can be as high as 22 per cent in patients with low levels of fitness, whereas patients who were fitter had only a four per cent mortality rate. A 2014 GLA study found that just a doubling of the amount of time people spend walking and cycling in London would save £2.2 billion pounds per year, as well as delivering 61,500 years of health benefit, every year. There's more and more evidence that if you're fat and fit you're healthier than someone who is a healthy weight and sedentary. Your best option is to be a healthy weight and to be physically active. But if you're an unhealthy weight, being active will significantly reduce the risk of things like diabetes and coronary heart disease, and reduces your mortality. More generally, physical inactivity is now a much greater factor in early death than obesity - Cambridge University research last year found that about 676,000 deaths each year in Europe were attributable to inactivity, compared with 337,000 from carrying too much weight. While both are obviously important health issues to address, it appears that physical inactivity is a more pressing problem. Obesity in children, in particular, hit the headlines recently, with a UCL study revealing that one in five British 14 year olds is now obese, with a further 15% of 14 year olds being overweight. This was released at about the same time, late last year, that the Centre for Social Justice released a report calling for decisive action to tackle the childhood Obesity Timebomb - the report can be read in full here. Although there is agreement that people cannot out-run a poor diet, physical inactivity is widely considered as a contributing factor to the obesity crisis and a cause of many deaths. People are 20 per cent less active than they were in the 1960s and Public Health England state that in the absence of concerted effort, people will be 35 per cent less active by 2030. Physical inactivity is the fourth biggest risk factor of mortality globally (after high blood pressure, smoking and high blood glucose). and accounts for six per cent of deaths. 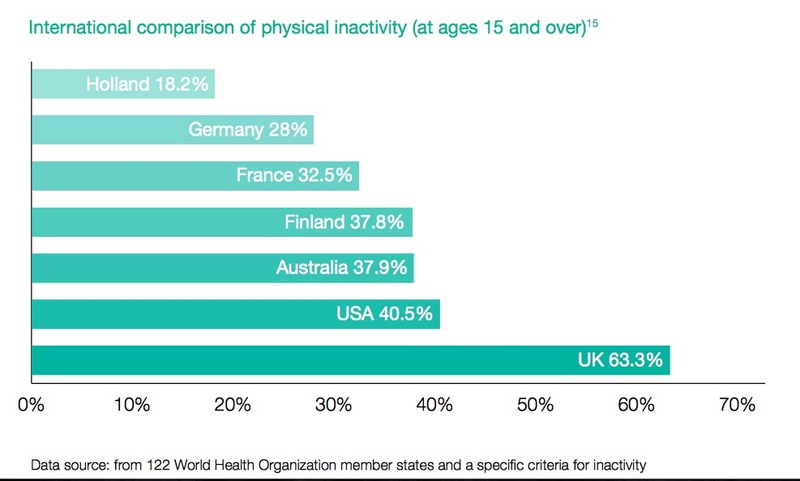 In England alone, physical inactivity is estimated to cost £7.4 billion a year. 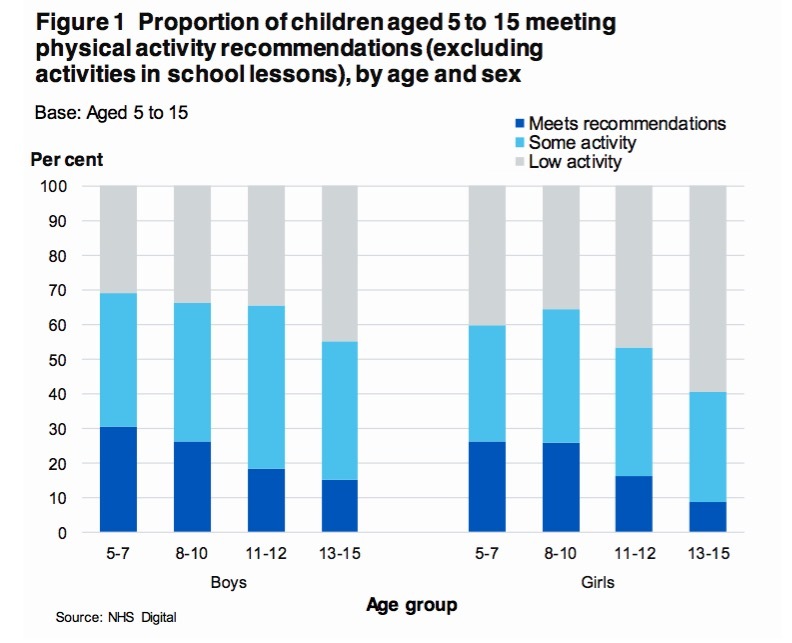 Physical activity amongst British children has been in decline over recent decades, and is now extremely low, especially among 11-15 year olds, and with girls engaging in even less physical activity than boys. It must be emphasised, however, that physical activity is primarily a way of tackling the risks of poor health more generally, rather than being a stand-alone solution to the problem of obesity. You can see a BBC Breakfast report on childhood obesity, that addresses Amsterdam and some of the policy issues raised by the CSJ report, here. There really is a mountain of evidence on the importance of physical activity, and why cycling can play such a big role in improving public health - this post has really only scratched the surface. So if there are any other important pieces of research or studies that you think deserve a mention, please add them in the comments below, or mention them on Twitter, @GBCycleEmbassy! Thanks to Joe Dunckley for much of the evidence here, and also to Peter Walker's Bike Nation, which is well worthing buying and reading in full.